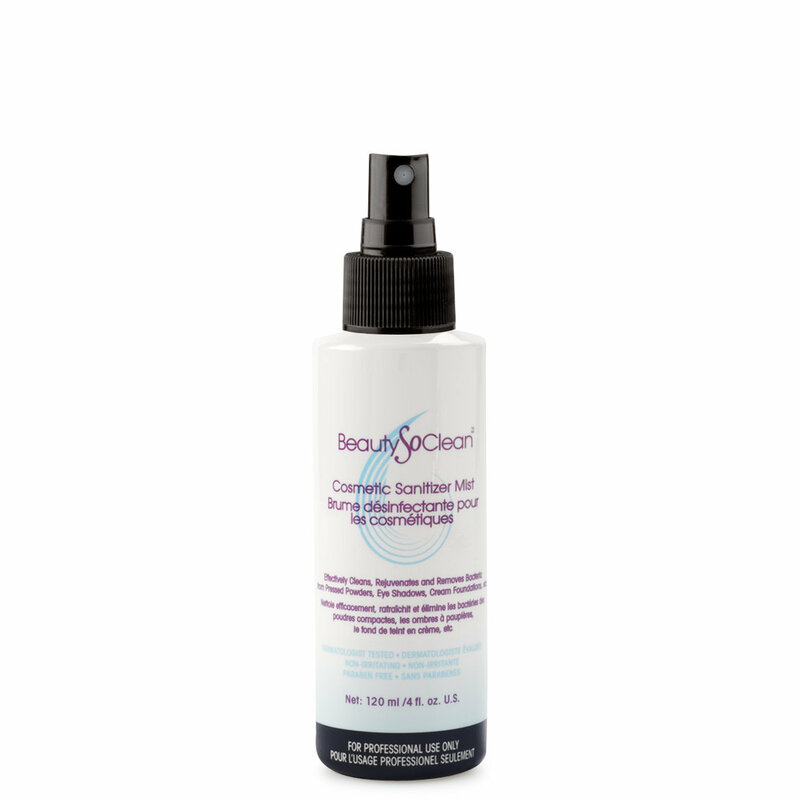 The BeautySoClean Cosmetic Sanitizer Mist removes bacteria and germs on powder-based products such as: eyeshadows, blushers, pressed powder, and bronzers, as well as cream-based products such as: compact foundation, concealers, and cream blush/eyeshadows. Hold Cosmetic Sanitizer Mist 6 inches / 15cm from product surface and mist once. Wait 10 seconds and the product is ready to be used! The 120 ml lasts up to 750 sprays, or about 3 months of professional use. So i am a makeup hoarder, and i keep my shadows and blushes til they are gone! I know your not supposed to, and i hate thinking about any bacteria and germs on my love, makeup. so when i saw this i was intrigued. Let me tell you it really dosnt change the texture of shadows or blushes. its great stuff, makes me feel a lot better about my hoarding and knowing that im at least helping to keep it all nice!!! 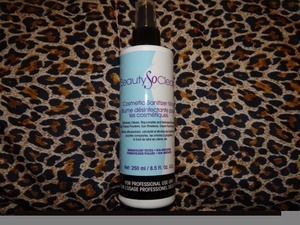 Cosmetics are not cheap so im all about this affordable spray!! I got the small one to carry with me. will purchase again for sure!!! If you're a makeup artist or just someone who has eyeshadows you need this! It cleans all the germs from your powder products which when you think about it, they're the most germy of all and more likely to spread bacteria, especially from eye to eye. So do everyone a favour and clean your makeup! No more grimey gross powders! It doesn't matter if your a make up artist or a makeup enthusiast, this makes keeping you beauty products clean easy,its a breeze to use, doesn't change the texture of your products and its so much better than spraying them with alcohol, I got the big bottle because is a good investment. I love this stuff! I'm so glad that Beautylish started to sell it. I am so crazy about sanitizing my products. It helps build client confidence and also keeps your makeup fresh. It's a MUA must have for any kit! If you are using makeup on several different people for any reason this product is non optional. Keeping your palettes clean is just as important as cleaning your brushes. Even if you are not a professional artist and only using your products on yourself, keeping them sanitized will be better for you and ultimately extend the life of your products. Wanted to try out before spending more than $16-already a lot for me to pay- and this is definitely a must have product. Not a makeup artist, but much of my make up is older than two-three years, and I need this! Will order larger size next time. Pressed Eyeshadows still soft and buttery after use...next up will be my bronzers and blushes. 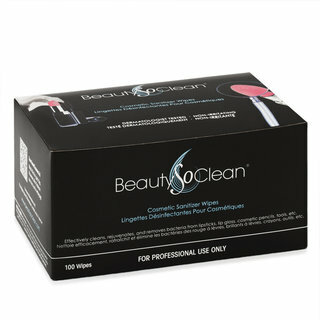 There really isn't another product out there that sanitizes and preserves makeup products like this does. The spray makes it quick and easy to use. The product is sanitized once it's dry which typically takes approximately one minute. Brushes are not the only place where germs and bacteria can hide - yet I never thought about this until I came across this product. I also love that the ingredients are natural and safe especially since everything ends up back on the skin. i have the big bottle of this in my kit and I love it. It's so easy to clean my makeup with this. I spray my blushes and eye shadows, my pencils and eyelash curler, and it doesn't dry your products out. Handy spray to keep blushes, bronzers, eyeshadows, foundation and concealer sticks sanitary. It does not dry out cosmetics and I would imagine it'd be invaluable to makeup artists. My only complaint is that the 250ml bottle leaks if inverted or knocked over. This is a staple to have in your kit or for personal use. There is nothing better than keeping all your products sanitary. Doing this is a must if you are a makeup artist. Making sure everything is tip top clean for your clients. Even for personal use is great.